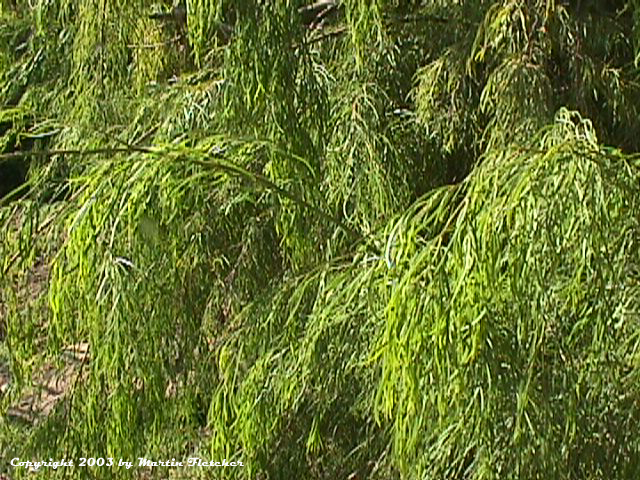 Acacia cognata is a small to middle sized graceful weeping tree that grows to about 15 feet. Acacia cognata has creamy yellow flowers in the late spring and early summer. The River Wattle can tolerate frost into the 20's and periods of drought. But will do well with some Summer water. Acacia cognata is a great tree for making a screen or informal hedge. I consider this a good small weeping willow substitute. There does seem to be a limit as to how long it can stand in soggy soil so Acacia cognata should not be planted in a bog. There is a dwarf version that has been making the rounds Acacia Cousin Itt. I have most often seen it growing in a pot 2-3 feet tall and wide. Acacia cognata, the River Wattle, a small weeping tree.